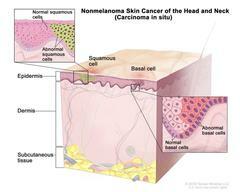 Stage 0 nonmelanoma skin carcinoma in situ; drawing shows skin anatomy with abnormal cells in the epidermis (outer layer of the skin). Also shown are the dermis (inner layer of the skin) and subcutaneous tissue below the dermis. Stage 0 nonmelanoma skin carcinoma in situ. Abnormal cells are shown in the epidermis (outer layer of the skin).